Almost all fires are small in their incipient stage and can be put out quickly if the proper firefighting equipment is available and the person discovering the fire has been trained to use the equipment at hand. Most facilities turn to portable fire extinguishers for fighting incipient stage fires. The requirements for portable fire extinguishers in general industry are governed by the Occupational Safety and Health Administration (OSHA) and are located in 29 Code of Federal Regulations (CFR) 1910.157. Underwriters’ Laboratories classifies fire extinguishers by the type of fire that they will extinguish. Class A fire extinguishers are used for ordinary combustibles such as wood, paper, some plastics and textiles. This fire class requires the heat-absorbing effects of water or the coating effects of certain dry chemicals. Extinguishers suitable for Class A fires should be identified by a triangle containing the letter “A.” If in color, the triangle should be green. Class B fire extinguishers are used for flammable liquid and gas fires such as oil, gasoline, etc. These fire extinguishers deprive the fire of oxygen and interrupt the fire chain by inhibiting the release of combustible vapors. Extinguishers suitable for Class B fires should be identified by a square containing the letter “B.” If in color, the square should be red. Class C fire extinguishers are used on fires that involve live electrical equipment that require the use of electrically nonconductive extinguishing agents. 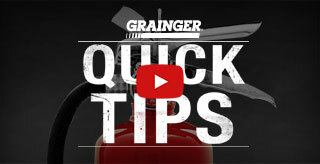 Once the electrical equipment is de-energized, extinguishers for Class A or B fires may be used. Extinguishers suitable for Class C fires should be identified by a circle containing the letter “C.” If in color, the circle should be blue. Class D fire extinguishers are used on combustible metals such as magnesium, titanium, sodium, etc., that require an extinguishing medium that does not react with the burning metal. Extinguishers suitable for Class D fires should be identified by a five-point painted star containing the letter “D.” If in color, the star should be yellow. Class K fire extinguishers are used on fires involving cooking media (fats, grease and oils) in commercial kitchens. Due to the higher heating rates of vegetable oils in commercial cooking appliances, the National Fire Protection Association (NFPA) Standard for Portable Fire Extinguishers (NFPA 10) includes a Class K extinguisher. These fire extinguishers work on the principle of saponification, which takes place when alkaline mixtures such as potassium acetate, potassium citrate or potassium carbonate are applied to burning cooking oil or fat. The alkaline mixture combined with the fatty acid creates a soapy foam on the surface that holds in the vapors and steam and extinguishes the fire. These extinguishers are identified by the letter K.
Portable fire extinguishers are labeled so users can quickly identify the classes of fire on which the extinguisher will be effective. The marking system combines pictographs of both recommended and unacceptable extinguisher types on a single identification label. Following are examples of typical labels. The A rating is a water equivalency rating. Each A is equivalent to 1.25 gallons of water. 4A = 5 gallons of water. The B:C rating is equivalent to the amount of square footage the extinguisher can cover, related to the degree of training and experience of the operator. 20 B:C = 20 square feet of coverage. When analyzing these ratings, note that there is not a numerical rating for Class C or Class D fires. Class C fires are essentially either a Class A or Class B fire involving energized electrical equipment where the fire extinguishing media must be non-conductive. The fire extinguisher for a Class C fire should be based on the amount of the Class A or Class B component. For extinguisher use on a Class D fire, the relative effectiveness is detailed on the extinguisher nameplate for the specific combustible metal fire for which it is suggested. OSHA requires employers to select and distribute fire extinguishers based on the classes of anticipated workplace fires and also on the size and degree of the hazard, which would affect their use. The following chart contains the OSHA-specified maximum travel distances to an extinguisher by fire class. According to the National Fire Protection Association’s NFPA 10 standard, the travel distance to a Class K fire extinguisher must not exceed 30 feet. Employers must inspect, maintain and test all portable fire extinguishers in accordance with 29 CFR 1910.157(e) and (f). Maintenance Requirements: The maintenance requirements depend on the type of portable fire extinguisher. Stored pressure or dry chemical type extinguishers do not require an internal examination. Water or steam type fire extinguishers should be discharged, disassembled and inspected annually (NFPA 10, 4-4.1.1). Dry chemical extinguishers that require a 12-year hydrostatic test are required to be emptied and subjected to applicable maintenance procedures every six years. Non-refillable, disposable dry chemical extinguishers are exempt from this requirement (29 CFR 1910.157(e)(4)). For additional fire extinguisher maintenance, follow the manufacturer’s suggested maintenance procedure. This information should also be securely affixed to the tested extinguisher. These records must be kept until the extinguisher is hydrostatically re-tested or until the extinguisher is taken out of service, whichever comes first. Q: What is Halotron? A: Halotron is a “Clean Agent” hydrochlorofluorocarbon (HCFC) discharged as a rapidly evaporating liquid that leaves no residue. It is intended for use in areas formerly protected by Halon portable extinguishers. Typical applications are in computer rooms, telecommunications facilities, cleanrooms, data storage areas and offices to help protect sensitive electronic equipment. Q: What is a “recharge”? A: A recharge is when a fire extinguisher needs to be refilled because it has been used or has lost pressure. You can tell if the unit needs to be recharged by the gauge on the fire extinguisher. On a fully charged fire extinguisher, the arrow should be pointing to 12 o’clock. If the gauge is in the red and says “recharge,” it can and needs to be recharged. If the gauge is in the red and reads “dispose of after use,” the fire extinguisher cannot be recharged and needs to be disposed of and a new fire extinguisher needs to be purchased.